Property Details: 2 Bedroom, 2 Bathroom Home with approx. 1161 square feet. 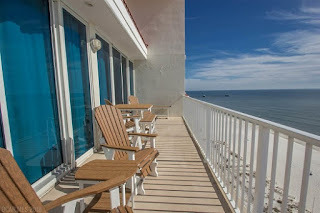 Lighthouse condo for sale in Gulf Shores. Coveted, beautiful 2 bdr/2 bath with bunk room at an incredible price! Floor to ceiling glass sliding doors to private balcony with access from the living area and master bedroom. Granite counters in the kitchen w/tile backsplash and stainless appliances. Well appointed and stylish furnishings. Tile throughout and full size laundry room. Super spacious master suite with double vanity dressing area, huge walk-in closet and large bathroom with jacuzzi tub and separate shower. Adorable bunk room w/TV for extra sleeping space. Excellent location within walking distance to festivals, restaurants and souvenir shopping. Wonderful resort amenities include huge zero entry pool, indoor pool, sauna, exercise room and covered parking.